By Andy Holmes is a brand new pocket sized board book for preschoolers and toddlers. 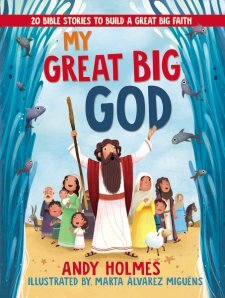 Filled with bold bright illustration, each page features a short re-telling of a well known bible story focusing on the power and mightiness of God, lovingly referred to a "My Great Big God". The rhymes make these stories memorable and children will enjoy them over and over again. The only thing I found might be confusing for some young readers is the New Testament story featuring Jesus. Rather than simply using Jesus, there is a clarification as Jesus being "my Great Big God's" son. While theologically true, I feel it does not suit the flow of this book. The glossy thick pages and padded cover are the perfect size for young children. This book is sturdy enough to stand up to use. The bright illustrations will draw in even the youngest of children. As a blogger for Booklook I received a copy of this book published by Thomas Nelson for the purpose of writing this review.